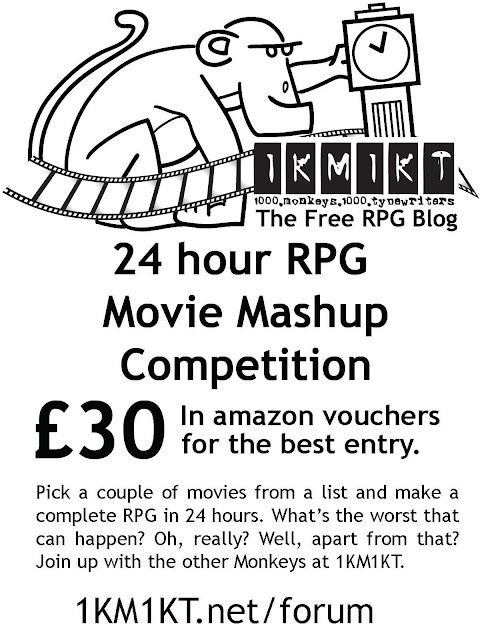 Welcome to the 2011 24 Hour RPG Movie Mashup Competition! Hosted at 1KM1KT and sponsored by The Free RPG Blog. 1. Pick just two films from this. 2. Post on 24 Hour RPG forum which two films you've chosen. 3. Spend 24 hours writing a roleplaying game on those two films. 4. Make sure you include an NPC called Keeton in your game. 5. Upload your game to 1KM1KT by 00:00 (GMT) 1st June 2011. 6. Make a thread here on 1KM1KT about your game. 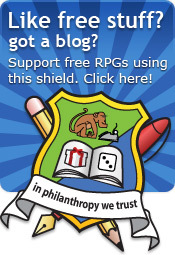 ...to find out who the winner is, or check here on The Free RPG Blog. Apart from the list above, you must obey the 24 hour RPG rules. The judge's decision is final. £30 will be in Amazon vouchers, emailed to you. I want the £30 to pay my D&D habit! What is it judged on? Proximity: How close to the two films is it? Complete: Is it complete? Could you run it? Attractive: Is it attractive to look at? Professional: How much effort went into layout and style? Extras: Did they include actual cover, index, character sheet or any other cool things you get in a proper RPG? I'm late to this party! That's a shame, we might run another competition soon. If you wrote a 24 hour RPG but didn't get it in before 00:00 GMT 1st June 2011 then we'd still like to see it. I want to do it again!